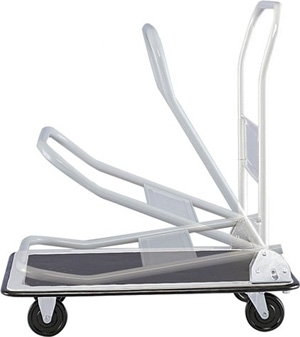 Solid, all-welded steel frame with large platform and anti-skid mat. 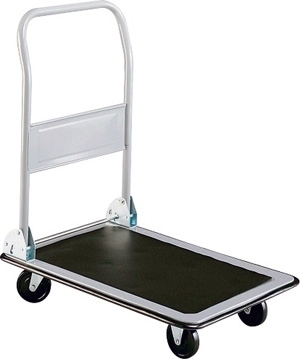 4" casters (two stationary and two swivel) provide easy maneuverability on any surface. 3/4" wrap-around vinyl bumper protects doors and furniture from damage. Folding handle for easy storage. Strong, chip-resistant light Gray enamel finish with Black vinyl trim. Capacity is 500 lbs. Dimensions are 36" x 24" Platform.